Let us help you control calories and fight hunger on the way to reaching your weight loss goals! 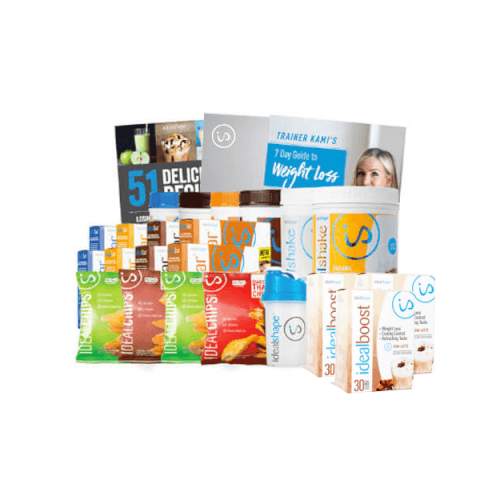 This complete weight loss bundle provides everything you need to have success in your journey including proven products, professional advice, and a weight loss plan that really works! Who said chips don’t have a place in your weight loss program? Not us! IdealChips provide 10g of protein and only 11g carbs, so you can enjoy your favorite crispy snack and still lose weight. In order to achieve meaningful, lasting weight loss, you need a detailed plan of action. The IdealPlan eBook is just that! This complete weight loss plan is the road map you need to find success on your weight loss journey.